The Huawei FreeBuds Lite is a high-quality and a truly wireless earbuds. It's a more affordable alternative to the Galaxy Buds and Apple Airpods 2. Huawei FreeBuds Lite takes on the wearable scene with its premium-looking design that is a reminiscent of the Apple Airpods. This wireless headset is actually a promising go-to device for fitness enthusiasts and active users in general. 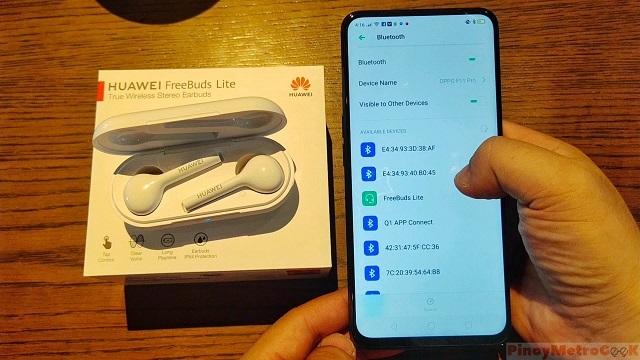 Join us in this Huawei FreeBuds Lite unboxing. We will also tackle a quick set-up guide right after the jump. 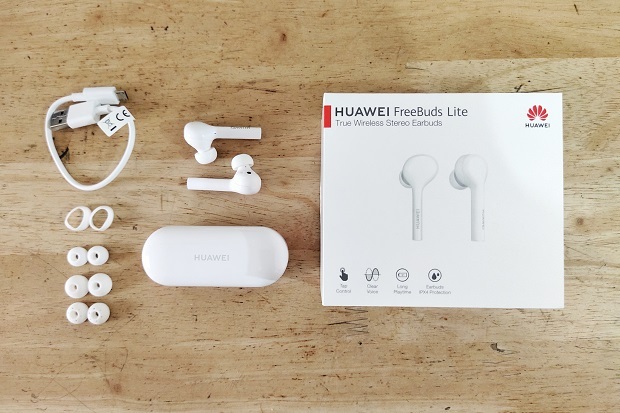 The Huawei Freebuds Lite comes with a clean, white, and squarish box. Opening it, you'll be greeted with the oval-shaped charging case that is wrapped in plastic. Underneath it, you will find another box which houses the warranty information, manual, microUSB cable, and extra bud rings of varied sizes. Going back to the main unit, Huawei FreeBuds Lite are tucked inside the charging case. This case features a microUSB port, a function button, and an LED indicator. To power the device, you'll need to press and hold the function button for 2 seconds while the earphones are inside the charging case. The LED indicator will flash in blue color. This also means that your FreeBuds Lite are ready to be paired. When pairing the device, you need to open the charging case while the earphones are inside the cradle. Again, you'll have to press and hold the Function button for about two seconds until the indicator flashes blue. This would mean that your FreeBuds are in Pairing Mode. 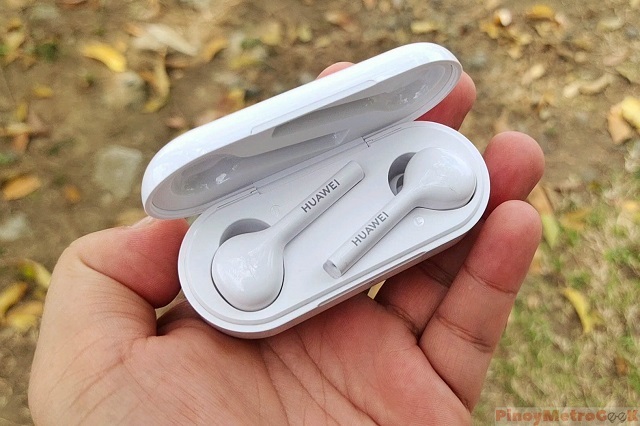 The Huawei FreeBuds Lite's build quality is very stylish and minimalist at the same time. The white case and earphones definitely come with a premium feel. The earphones are made up of high-grade polycarbonate plastic; while the case features magnetic pins to secure the earphones in its cradle. The Huawei FreeBuds Lite comes with a sleek design philosophy. The earbud itself has a primary microphone and another mic noise cancellation. When playing music, you can just double tap the right earphone to pause or play or skip to the next track. The sound quality is great. The Bass is very clear but not to the point that it's overpowering. It also registers well in Higher frequencies, as well as the mid ones. It is supported by an app which gives you all the information you need about the FreeBuds Lite. You can just double tap the FreeBuds to answer or reject calls. Likewise, removing the earbuds from your ear will pause the music; and you can double tap the left earbud to activate the voice assistant. 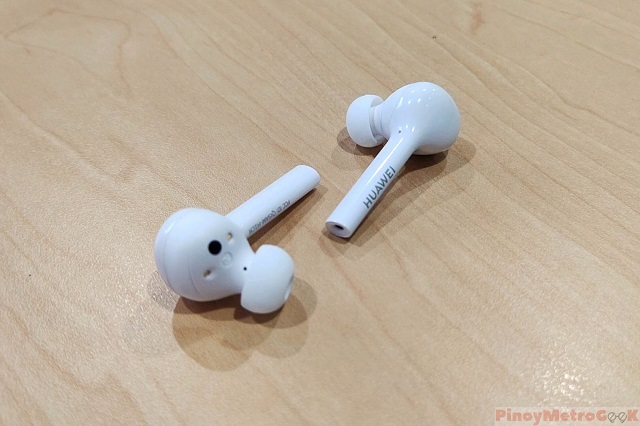 Its Infrared sensor can sense when the earbuds are in your ears and when you take them out. The Freebuds Lite adopts ENC technology and 4 mics to improve your voice quality and ensure crystal clear conversations. Charging the device is pretty simple. While the earbuds are inside the closed case, you can use the microUSB cable or a wireless charging pad. The LED indicator is red when the device is low in battery and green if it is fully charged. According to Huawei CEO Richard Yu, the Freebuds Lite promises 12 hours of payback with the charging case. 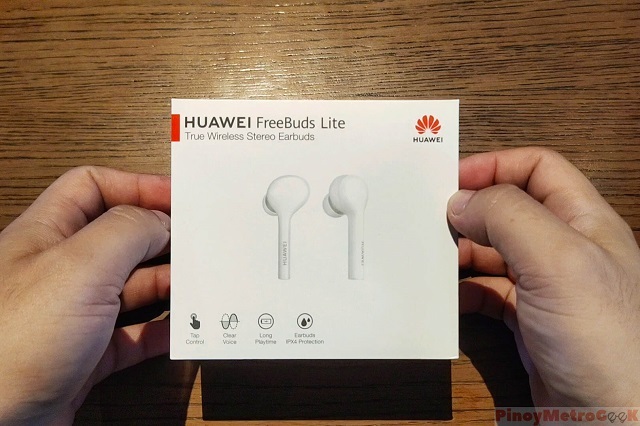 The Huawei FreeBuds Lite is a very promising device that offers a true wireless experience. 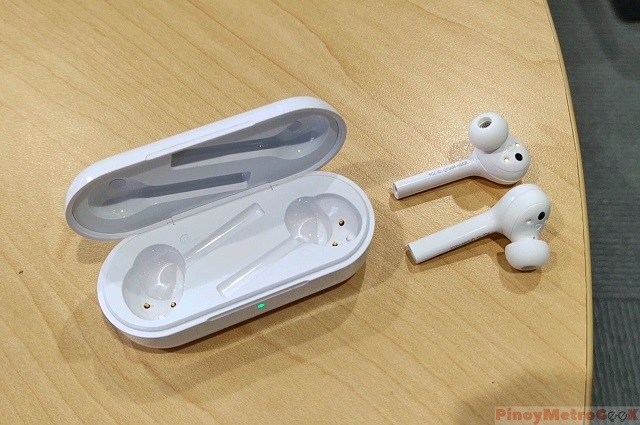 It is positioned to be a competitor to the newly released Apple Airpods 2. It is very straightforward to use and gives out superior, very clear and realistic sound that drives you forward with your fitness routine. It is also IPX4 certified which means it has water-resistant protection to tame body perspiration and wet elements from destroying your musical vibe. The whole experience using the Freebuds Lite could be better when you're using a Huawei phone; nevertheless, it's still a great workout companion.